Zhongwei Chen, a chemical engineering professor at the University of Waterloo, and a team of graduate students have created a new low-cost battery design using silicon instead of graphite, boosting the performance and life of lithium-ion batteries. Waterloo’s silicon battery technology promises a 40 to 60 per cent increase in energy density (energy storage per unit volume), which is important for consumers with smartphones, smart homes, and smart wearables. It also means an electric car could be driven up to 500 kilometers (311 miles) between charges while reducing its overall weight. The Waterloo engineers found that silicon anode materials are capable of producing batteries that store almost 10 times more energy than with graphite. “As batteries improve, graphite is slowly becoming a performance bottleneck because of the limited amount of energy that it can store,” said Chen, the Canada Research Chair in Advanced Materials for Clean Energy and a member of the Waterloo Institute for Nanotechnology and the Waterloo Institute for Sustainable Energy. The most critical challenge the Waterloo researchers faced in the new design was the loss of energy that occurs when silicon contracts and then expands by as much as 300 per cent with each charge cycle. The resulting increase and decrease in silicon volume forms cracks that reduce battery performance, create short circuits, and eventually cause the battery to stop operating. To overcome this problem, Chen’s team along with the General Motors Global Research and Development Centre developed a flash heat treatment for fabricated silicon-based lithium-ion electrodes that minimizes volume expansion while boosting the performance and cycle capability of lithium-ion batteries. “The economical flash heat treatment creates uniquely structured silicon anode materials that deliver extended cycle life to more than 2000 cycles with increased energy capacity of the battery,” said Chen. Chen expects to see new batteries based on the design on the market next year. Their findings are published in an open-access paper in the latest issue of Nature Communications. Silicon has the potential to revolutionize the energy storage capacities of lithium-ion batteries to meet the ever increasing power demands of next generation technologies. To avoid the operational stability problems of silicon-based anodes, we propose synergistic physicochemical alteration of electrode structures during their design. 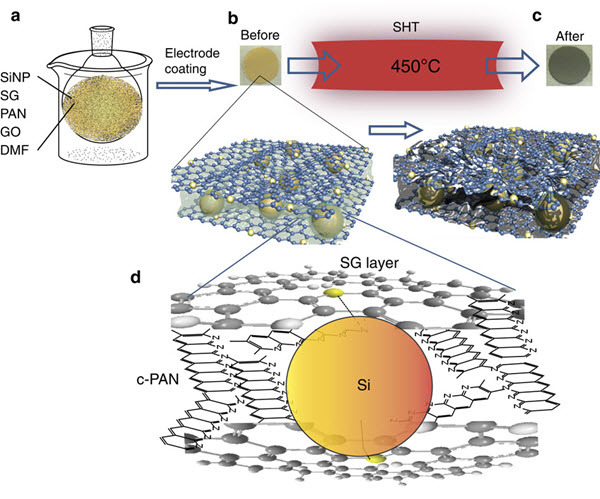 This capitalizes on covalent interaction of Si nanoparticles with sulfur-doped graphene and with cyclized polyacrylonitrile to provide a robust nanoarchitecture. This hierarchical structure stabilized the solid electrolyte interphase leading to superior reversible capacity of over 1,000 mAh g−1 for 2,275 cycles at 2 A g−1. Furthermore, the nanoarchitectured design lowered the contact of the electrolyte to the electrode leading to not only high coulombic efficiency of 99.9% but also maintaining high stability even with high electrode loading associated with 3.4 mAh cm−2. The excellent performance combined with the simplistic, scalable and non-hazardous approach render the process as a very promising candidate for Li-ion battery technology.